Hyped up as "the greatest Money In The Bank Pay-Per-View in history", MITB 2016 didn't quite surpass the outstanding 2011 card, which had several high-quality matches and was capped off by the unforgettable John Cena-CM Punk main event. It was, however, the best supershow of the year thus far, and the DVD release allows you to relive this memorable event. The opening Fatal Four Way match for the WWE Tag Team Titles, pitting The New Day against Enzo and Cass, Gallows and Anderson and The Vaudevillains, is a good opening contest and, despite some botches near the end (one of which, by Gallows, was so obvious on the night that it has been edited out here), the participants maintain crowd interest all the way. Baron Corbin vs. Dolph Ziggler came after their rivalry had peaked, making this a satisfactory yet ultimately unwanted match to those in attendance. The women's tag bout (Charlotte and Dana Brooke vs. Becky Lynch and Charlotte) is okay but feels more like a Raw match, although it does have an unexpected twist after the finish. Sheamus vs. Apollo Crews will be remembered fondly in the future if Crews goes onto achieve main event status in WWE; hopefully, the Draft will allow the talented Apollo to begin rising up the ranks on SmackDown. We then come to the first of three major matches on this show, the first-time clash between John Cena and AJ Styles. Supported by a hot crowd, this is an excellent encounter, featuring a topnotch performance by AJ (the layout of the match means that around 70% of the offence, and great offence at that, comes from Styles). The only black mark against it is the slightly anticlimactic finish, although it was clearly designed to set up a rematch further down the line; as Taz pointed out on his (highly enjoyable) radio show The Taz Show, WWE could have come up with a more creative way to extend the feud than what we got here. The Money In The Bank Ladder match (this year starring Dean Ambrose, Kevin Owens, Sami Zayn, Chris Jericho, Cesaro and Alberto Del Rio) is a tremendous spot-fest, and one of the better MITB matches to date. (I should have mentioned that the promo segment involving KO, Y2J and ADR after the Tag Team Title match is well worth watching as it contains some hilarious banter between the three men.) Rusev vs. Titus O'Neil for the United States crown is another match that would have been better on Raw, for it existed here solely to allow the crowd to recover before the main event; in this spot, the match was never likely to succeed. Finally, the main event between Roman Reigns and Seth Rollins for the WWE Title is a very good match, and another strong headline performance by the much-maligned Reigns. Rollins shines in his first match since his injury from the previous November, and post-match we get a huge moment which I won't spoil here; all I will say is that you should watch this right up until the very end of the show. Because the MITB event lasted well north of three hours, the card has been condensed somewhat to make the DVD running time. Some advertisements during the card and the Kick-Off panel in-show reaction segment are not here, which admittedly is not a great loss. What is annoying, though, is that there are no extras whatsoever, meaning that both Kick-Off Show matches (The Golden Truth vs. Breezango and The Lucha Dragons vs. The Dudley Boyz) are absent. This is a card which really should have been released on a two-disc DVD so that the main card wouldn't have been stripped down, as slight as the cuts are to the PPV itself, the Kick-Off bouts could have been included, and some other extras could have been thrown in too. Hopefully, WWE will think about this going forward, given the rumours that three-hour+ PPV events could be the norm going forward, at least for the bigger cards. 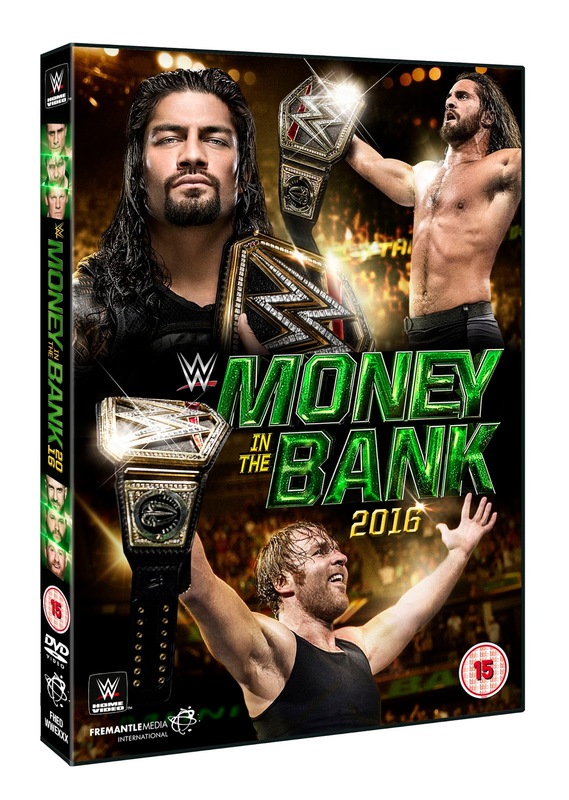 This aside, Money In The Bank 2016 is well worth watching and, therefore, the DVD of the show is well worth owning.